Sai Baba set a standard for honesty in exams? Sathya Sai Baba often related how he had cheated at school, writing the entire papers of two student who were his closest friends. Read Sai Baba’s account of his cheating here or a full account in Sathya Sai Speaks here This shows that Sai Baba, hailed by PMs and Presidents as a supreme preceptor for educating Indians, was a part of the problem and a bad example. 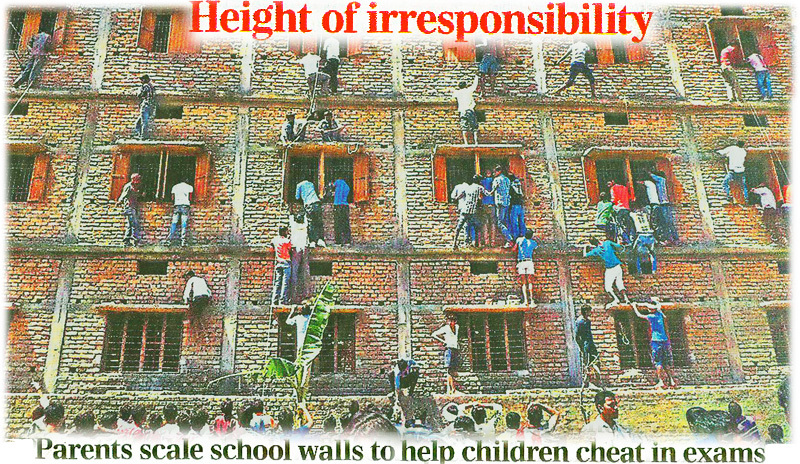 “Education officials in India’s eastern Bihar state have launched an inquiry after photos of the parents and relations perched precariously outside a four-storey school’s windows were published on the internet. Some were trying to hand in answer sheets folded into paper planes. Should we shoot them?” asked Prashant Kumar Shahi, Bihar’s education minister. speaking at a news conference after television news channels aired the incriminating photo. Though this seems shocking to the uninitiated, it has been a most common practice of numerous parents in many Indian colleges and also universities to beg, cheat, bribe and threatened educational authorities if their offspring does not achieve high marks. It is widely known and published that higher castes regarded almost automatic passes for their sons and daughters as the duty of the teachers/examiners (usually of the same caste) and bribery was extremely common. Forged documents were often found, and we could sometimes even see they were photocopies with the titles and other details changed (by amateurish inserts).This I know as I was on a board at the University of Oslo for assessing the qualifications of foreign students where the administration was in doubt about their genuineness. A few Indian students tried subtly to bribe me to pass them in the logic and philosophy entrance examination at University of Oslo, which I both set and was and evaluated. The flaunting of letters after one’s name in India is well-known and often of absurd nature… and one should always be ready, if need be, to question the claims of Indian aspirants and even apparently fully accredited Ph.D’s. This entry was posted on March 30, 2015 at 1:01 pm	and is filed under Sathya Sai Baba. You can follow any responses to this entry through the RSS 2.0 feed. You can leave a response, or trackback from your own site.